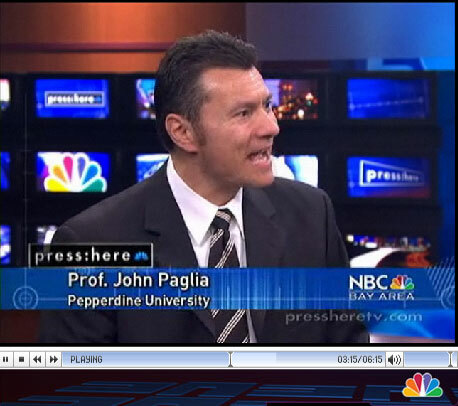 I should have written much earlier about my finance professor, Dr John Paglia. But the last string of articles published by CNBC, LA Times, ABC News and others reminds me that when you have the privilege to receive market information first hand, you should brag about it! The costs and barriers to doing business are too high and most measures to address these issues have failed, experts and small business leaders say.According to a new survey, more than 80 percent of small business owners said business stimulus measures last year unfairly benefited public companies. The survey, conducted by Pepperdine University, also found that 62.5 percent of large private businesses feel publicly traded companies received an unfair allocation of resources. John Paglia, finance professor and senior researcher with Pepperdine Private Capital Markets Project, said the disapproval for the stimulus is at an “all-time high” because enough time has passed since the measures were put forward to see their results. The stimulus measures include the Federal Reserve’s purchase of treasuries and mortgage-backed securities to reduce interest rates and improve market liquidity, tax incentives, government grants and lending programs, such as those from the Small Business Administration. Paglia said the survey results show that small businesses are hoping the president will address the difficulty in accessing capital. The survey respondents represented 1,224 privately-held businesses, 45 percent of whom had revenues under $5 million. The responses were collected in early January. Paglia said that historically, small businesses have been more optimistic about economic growth opportunities. “It appears the lack of capital availability has soured their outlooks,” Paglia said. In the survey, small businesses said “increased access to capital” would contribute to the most job growth this year. The theory goes that small businesses are the center of job creation. So if they’re not getting their fair share of federal funds, how will they be able to solve the nation’s vexing unemployment problem? It’s a good question, then, that is raised by a recent Pepperdine University study in which four-fifths of the respondents say that privately traded companies—those not listed on major stock market exchanges—have gotten hosed by the government’s stimulus plan. The survey found that some 80.3 precent of small private business owners felt that economic stimulus funds were geared far more towards publicly held companies. Just 10.6 percent said the money has been split fairly. For sure, job growth has been slow across all areas of the spectrum. But small businesses are having an especially hard time considering the lack of availability for credit. “There is a prevailing view, especially among small private businesses who (sic) represent Main Street that the benefits from the federal stimulus measures largely missed privately held businesses,” John Paglia, lead researcher of the Pepperdine Private Capital Markets, said in a statement that accompanied the research. Interestingly, of the 1,224 privately held businesses, capital suppliers, intermediaries and service providers surveyed, nearly 70 percent said small businesses will create more jobs in 2011, as opposed to 17.5 percent who said publicly traded companies will be more responsible for driving employment. But the survey results do jibe with recent data from the National Federation of Independent Business, whose members have expressed only a modest level of confidence and persistently cite government obstacles as a reason for their pessimism. The problem with such things is they are based largely on perception. Recovery.gov, which is set up by the government to track stimulus spending, does not break down disbursements by public and private companies. One thing the private companies have to bolster their argument: When the stimulus was approved in February 2009 the unemployment rate was 8.2 percent. It’s now 9.4 percent. As the fight heats up over extending the U.S. debt ceiling, 60% of private businesses and their lenders don’t want to see an increase out of fear it will hurt the economy, according to a new poll from Pepperdine University’s Graziadio School of Business and Management. The school surveyed 915 privately held businesses, capital suppliers, intermediaries and service providers as part of its Private Capital Markets Project. Just 22% said they supported raising the fast-approaching $14.29-trillion debt ceiling. The poll found that 31% said raising the ceiling would be detrimental to the economy over the next year, with 29% saying it would be somewhat detrimental. On the other side, 7% said an increase in the debt ceiling would be beneficial to the economy, and 15% said it would be somewhat beneficial. The rest of the respondents were neutral on the issue. This entry was posted in Capital Market, Featured, Finance. Bookmark the permalink.